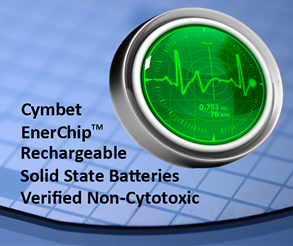 Cymbet EnerChip™ rechargeable Solid State Batteries (SSB) are created using semiconductor processing techniques on silicon wafers. The EnerChip devices are completely different from traditional batteries and supercapacitors that contain dangerous chemicals and have toxic waste disposal issues. New products that utilize EnerChip devices are freed from many of the assembly, transportation, use and disposal restrictions caused by using legacy energy storage technologies. EnerChips use surface mount technology, no holders or other connecting apparatus is used. The gamma sterilized Cymbet EnerChip™ bare die batteries were found to be non-cytotoxic (0% cell lysis) using both the Medium Eluate Method Eluation Test and Agar Diffusion Test feasibility screening procedures. The lack of any adverse biological responses in these very sensitive in vitro cell culture assays is indicative (although not a guarantee) of biocompatible test results in the other in vitro and in vivo aspects of biocompatibility as suggested by the ISO 10993-1 and FDA G95-1 guidelines. To minimize the environmental impact, the EU restricts the use of certain hazardous substances, which include lead, cadmium, hexavalent chromium, mercury, polybrominated biphenyls [PBBs] and polybrominated diphenyl ethers [PBDEs] in the electrical and electronic equipment. To achieve reduction of these substances, the European Commission has created a directive on “RoHS”. A complete analysis of the Cymbet EnerChip product family documented there is no cadmium, lead, mercury, hexavalent chromium, PBBs and PBDEs in formulation of the products. And none of the ingredients for our products exhibit contamination by these heavy metals. On the basis of collected data, Cymbet has determined all EnerChip are RoHS Compliant. In addition to RoHS compliance, Cymbet has performed additional analysis to insure EnerChip products do not contain hazardous substances as listed by the U.S. Agency for Toxic Substances and Disease Registry. EnerChip products do not contain Arsenic, Lead, Mercury, Cadmium or any other chemicals or compounds listed in the top 50 items on this CERCLA priority list. All Cymbet EnerChip devices meet the requirements of 49 CFR Subchapter C Subsection 172.102 Special Provision 188. Therefore, they are not subject to any other requirements of Subchapter C (Hazardous Materials Regulations) as EnerChip devices are packaged to prevent short circuits and packed in strong packing for conditions normally encountered in transportation. EnerChips are made from nonflammable materials with a solid state construction, and do not have any of the safety issue concerns of Lithium-ion batteries. Because EnerChip devices are manufactured and packaged like other solid-state integrated circuits, they have similar disposal methods with no materials to recycle. Solid State Batteries are currently covered by the EU Battery Directive 2006/66/EC but are also a key technology development as described in Preamble item 12 to “encourage technical developments that improve the environmental performance of batteries and accumulators through their entire life cycle”.Contact the Cymbet Support Team for information on the methods for successfully meeting the EU directives and other global environmental initiatives.